One of the hardest position groups in the NFL to consistently fill year by year, NYG is standing at the edge of a cliff with their CB group. Janoris Jenkins is still a solid number one but they are banking on young, unprovens behind him.. Sam Beal is in line for major playing time after missing his entire rookie season with a shoulder injury. Grant Haley flashed as a nickel in 2018, but the UDFA looks limited. Antonio Hamilton, Tony Lippett, and Michael Hunter round out the group and when it comes to comparison with the rest of the league, these guys don’t stand out to say the least. Hunter, however, has always been a guy that I have wanted to see get more and more action. Summary: Third year sophomore entry. Murphy missed 7 games in 2017 with a broken foot but came back with a 1st Team All Pac 12, 2nd Team All American performance. Despite the lack of game–experience, Murphy proved to be one of the more NFL-ready corners in the class with his top shelf athletic ability and ball tracking. He does play a little light which will need to change in the NFL, but his aggressive style and fast twitch reactions make him scary to throw near. If the technique can get cleaned up and he can improve in zone coverage, he has quality starting corner written all over him. *Physically Murphy is probably the safest and most reliable corner in the class. Everything seems smooth and easy for him. Body control and balance is just as important as speed at the CB spot and Murphy is top-shelf there. If there is one corner that I think sneaks in to the top10 , it’s this kid. Summary: Baker was a three year starter for the Bulldogs that progressively improved as a prospect from the beginning of 2017. The two-time all SEC defender (1st Team in 2018) brings the kind of confidence and swagger that can take on the numerous challenges of playing cornerback in the NFL. He can be left alone on an island and stick with anyone on all levels of the route tree as well as make plays on the ball like a receiver. His issues can be correctable, mainly the technique-based and mental ones. The lack of power presence can be an issue at times but in a league where contact is allowed less and less in coverage, the corners that can get the job done via instincts, agility, and speed stand out a bit more. *Another safe pick here that may have a limited upside, but at this position you just want reliable. That is Baker is a nutshell. I love the competitive spirit, the swagger he shows on the outside. Do I trust him against a Michael Thomas on an island? Probably not. But at the end of the day that isn’t the job of a #1 corner on most teams. He can fit in to any coverage scheme and any role, right away. Summary: After three seasons, two of which as a starter, at Presbyterian after the program dropped from a scholarship program. He transferred to Temple without having to sit out and made his mark in a big way. The physical, chiseled, speedy corner earned 1st Team All AAC honors and became a leader of the defense right away. He quickly earned a single digit jersey number, given to the team’s toughest players, and he proved he deserved it all year. Ya-Sin is one of the best competitors in this entire class and he pairs that with a solid size/speed combination. His skill set needs to be cleaned up to avoid penalties, but he has #1 corner written all over him if he does. *I was on this kid pretty early in the year and I am glad to see him get the attention he deserves. The frame and physical presence stands out the second you turn the tape on, but I think there are some inherent traits that can’t be taught. He shows the ideal blend of aggression and patience combined with enough playing speed to factor in any situation. If he cleans up the techniques and gets more consistent, he has the most upside of all the CBs in the class. Summary: Junior entry that was an All American in both 2017 and 2018. Leaves Notre Dame as the all time leader in pass break ups and was a finalist for the Jim Thorpe Award this past season. Love is a pro-ready corner that checks a lot of boxes when it comes to technique, reaction speed, and quickness. He is a weapon against the pass when covering the short and intermediate passing game. While his lack of size and strength can be exposed by certain matchups, Love has the kind of game that can be moved inside-out. Safe and reliable corner that has starter written all over him. *The thing that stood out to me about Love over and over was his safe, dependable play. He looked like a pro each week from an awareness and technique perspective respectively. Rarely did I ever find him out of position or lacking the control needed to make plays on the ball. I know I’m not getting a star here, but I am getting dependability and as I said earlier, that is what I want at the position. Summary: Junior entry. Two year starter that evolved in to one of the top corners in the SEC in 2018, earning 2nd Team All conference honors. Williams stands out among his peers off the bus with his rare combination of height, length, and weight. After he puts the pads on and starts moving around on the field, it’s hard not to get overly excited. Williams is a fluid and easy mover that has so much range and a wide radius that throwing in his direction is a risk in and of itself. He really took his game to another level as 2018 progressed and an argument can be made he has the highest ceiling among all corners in this class. *It is rare to see a cornerback with this kind of size that nobody even discusses as a possibility to be moved to safety. The long-limbed mover has a unique skill set that can be the kind of factor in a defense that opposing QBs don’t even want to look at in coverage. The radius here is ridiculous and he isn’t a poor athlete at all. The ceiling here is the highest in the class. I know of 2 current scouts that say their teams list him at #1 in the group. Summary: Third year sophomore entry. In his two seasons as a starter, Williams was an All American and 1st Team All SEC both years respectively. He has the ideal length and height for the position but not at the expense of movement. His hips are fluid and flexible and the body control he shows while facing the action is top shelf. Williams comes from the Deion Sanders’ school of defending, meaning he wants nothing to do with tackling or the physical side of the game. He lacks strength and desire but the ability and potential to shut down a number one receiver is enough to make up for it. Williams has star potential but needs to clean up some deep passing-defense. *The outlook on Williams very much depends on what a team is looking for from their corners. If you want a guy that can move with any kind of receiver all over the field and make plays on the ball, this could be your guy. However if you want someone that is physical, blue collar, intelligent, Williams can be far down your list. He makes the highlight tape look legit, but if you watch 5-6 games of his in the SEC, you’ll see more negatives than positives. The upside is real, though. Summary: Junior entry with two years of starting experience. A First Team All Big 10 defender that may not have the ball-production that some look for, but Long is one of the best pure cover corners in the class. His ability to minimize separation between himself and the receiver on all levels of the route tree is something that will translate to the league right away. His hips are fluid and his feet are light. Long also plays with a pitbull-mentality. He wants to fight his man and shows no hesitation when it comes to mixing it up and playing physical. There is a combination of positive traits here that can really turn in to something at the next level. Quarterbacks rarely want to throw in his direction. *Kind of the complete opposite from Williams above. Long doesn’t have the most attractive highlight tape but a big part of that is the fact QBs did not want to throw his way. He may be a top 3 man-cover corner in this class and he brings the baller mentality to the table. I believe most have Long as a day 3 pick but if you do end up getting him there, it might be the steal of the draft. Summary: Fifth year senior. Originally committed too Ohio State but he didn’t make the grades and ended up at junior college where he played safety for a couple years. He started for a year and a half at Kentucky but it wasn’t until we were a few weeks in 2018 where he really started to stand out. In a uber-talented secondary, Johnson leaves as the top pro prospect. Physically he can do it all. Tall, long, fast, physical, and under control. He still has a rawness about his skill set but nobody would be surprised if he ended up being the top CB in this class down the road. *I know a handful of scouts that say Johnson, by a wide margin, is the top CB in the class. I never fully bought in but I will see he is the most impressive specimen. I think he deserves a “buyer beware” label. And I will go on record that he is the one CB in this class that I think is worth trying to move to safety. He has the body, he has the mentality, and he has the experience. The holes in his game as a CB can be hidden a bit at safety, a spot where I think he could be a legit sideline to sideline rangy guy that NYG may be a perfect fit for. Summary: Fifth year senior. A former wide receiver that ended his career with two straight years where he ended up on the 1st Team All Missouri Football Conference list. His production across the stat sheet also got him an All American spot in 2018. Brown is still relatively new to the cornerback spot in relation to other prospects and he has shown flashes of very high quality play. His size and foot-speed in addition to the natural ability to make plays on the ball makes him an attractive draw. There are holes and he is making a big jump in competition but the progress path he is on right now could lead to a starting caliber pro corner. *Quick funny story. 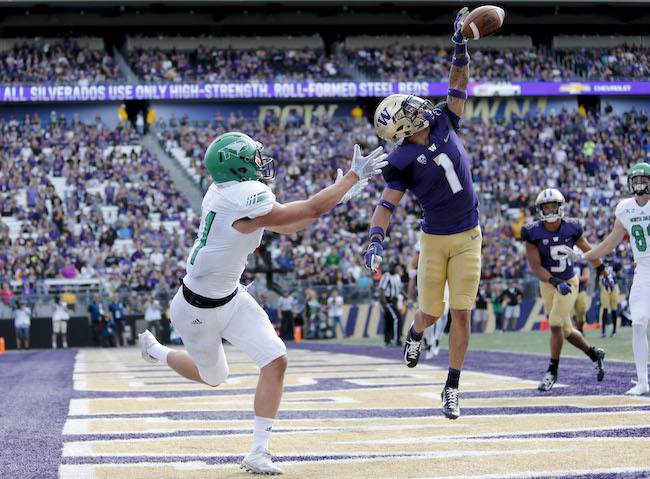 A scout was at the combine, clearly delusional after being there all week (it is a tough week for them), and was writing down notes for the draft’s top corner Byron Murphy while watching Brown in drills. Ironic part is, my game notes from the fall had Byron Murphy comparisons multiple times. Ok maybe not that funny to you. Anyway, Brown stood out all year albeit against low-level competition. Not only did he look like he was on a different level, his techniques and body control were on point. Really intrigued by him. Summary: Junior entry with two years of starting experience. Honorable Mention All ACC in 2017 and 2nd Team in 2018. Mullen fits the mold of the ideal cornerback when it comes to height, length, and speed. He can cover a lot of ground and showed the ability to stick to his man as a straight line mover up and down the field. His has loose hips, quick feet, and knows how to attack the ball like a receiver. He is limited by a lack of physical hunger and hustle that may be hard to all of the sudden change in the NFL. Mullen wasn’t challenged much in college so there is a lot of unknown here, but the tools are there and he can wear a few hats. He is a high-upside, inside-outside corner with a boom or bust label. *High risk, high reward prospect here. I just haven’t seen enough on tape from him that screams starting-caliber corner. It came in flashes here and there, but for a kid that played more games than most corners over the past two years, I wish he showed more. Strong Points: Fifth year senior. A four-year starter that made the All Big 12 team every season. A consistently productive across-the-board defender that plays bigger than he is listed with exceptional quickness and body control. After playing through a torn pec during his entire senior season, Peavy was one of the biggest combine snubs in the nation. While he lacks the ideal triangle numbers, the growing importance of nickel corners should boost this kid up in to early day 3, maybe even late day 2 territory. Whoever grabs this kid is going to be pleasantly surprised, as I think he will outperform several corners drafted ahead of him. *Within the next year or two, a the nickel corner may be considered a starting lineup spot in every defense. If you look at snap totals, they are on the field just as, if not more often than the third linebacker. Peavy wasn’t at the combine but I’ll bet my full salary on the fact he gets drafted higher than 5 of the guys that were invited. Productive, tough, quick, and smart. Put this kid in the slot and watch what happens. Summary: Junior entry. Former wide receiver that made the move to cornerback halfway through his freshman year. He was a natural at the position and surprised coaches with how quickly he picked up on the nuances. Layne is a natural because of his tremendous lower body fluidity and aggressive approach to the game. He is limited against the vertical passing game, but he knows how to cover it up as much as possible and he can be a dangerous corner to throw near underneath. His body type may not hold up against the power game, but in time he can be a very solid zone coverage corner that will make plays. *Layne is a popular pick among the media and fans. By no means do I dislike him ,after all I still see day 2 here. I think he has the size and speed that everyone wants to work with in today’s NFL but there were too many negatives on tape that don’t necessarily show up on the stat sheet. I’ve been told a few teams have a round 1 grade on him by the way. Summary: Four year starter that burst on to the scene as a freshman in 2015, earning 1st Team Freshman All American honors. Minus a hiccup in 2017 where a knee injury hampered him, Lewis-Marshall quietly had one of the best careers of all the corners in this class. There are athletic-based shortcomings in his game, namely long speed, thus a move to safety may be in his future. No matter where you put him, though, Lewis-Marshall brings a constant sense of urgency, physical play, and instincts to the secondary. He is the kind of day 2, early day 3 pick that ends up starting in year 1. *Here is the other corner that I think some teams should look hard and long at when it comes to making the transition to safety. I don’t mind starting him at corner, where he balled his entire career at USC. But the pitbull mentality can be better used while also hiding some movement issues he has. Summary: After an accomplished track and field career in high school, Johnson found himself at the bottom of the wide receiver depth chart at Houston for two years. He was then moved to cornerback prior to 2017 and while he did go through growing pains, he showed more than enough upside as a senior in 2018. He showed the obvious ball-skill advantage with his history as a pass catcher but the fluidity combined with size and speed make him a project worth gambling on. He needs time to add some strength and become more physical, but all of the tools and more than enough ball production are there. *Another high-ceiling prospect that some are labeling a first rounder based merely on upside and potential. Johnson’s tools and lack of experience have made some believe they can coach him up in to a top tier, shut down cover man. I don’t see it because of short area movement and I’m not sure I could come up with a list of 5 players in this class that are worse at the physical side. I understand upside, but not higher than the bottom of round 3. Summary: Four year contributor that was in and out of the starting lineup based more on formations and schemes, not his play. Two time Honorable Mention All Pac 12 that had a knack for making plays. Those last two years, he totaled 6 interceptions, 4 forced fumbles, 2 fumble recoveries, 3 defensive touchdowns, and a punt return for a touchdown. The explosion in short spaces along with his muscular, powerful frame is attractive if you are a team looking for a lot. I think he brings some versatility to the middle of the field and can help a team in a variety of ways. *Another slot corner that could easily be taken much higher, or much lower, than where I have him. I know, major risk there. Amadi carries a lot of the mentality and short area burst traits that I like, but I question the awareness and instincts. He was a kid that had a hard time holding on to a specific role at Oregon and while that may have been a coaching error more than anything, it could have also been that his football IQ issues kept showing up. Nonetheless, I like how this kid plays. An intriguing small school prospect off the beaten path, Harris has had plenty of big play success over his career. After missing all of 2017 with an achilles injury, he bounced back to form, where he put himself on the radar with an All American season 2016. Triangle numbers are attractive as are the anticipation and instincts. He was notably lacking power presence at at a lower level of football, thus he has practice squad written all over him as he needs to build the body a bit. There are some naturals with him that I like a lot, though. I’m not sure many realize how susceptible this position group is, especially if Jenkins were to ever go down. While the argument can be made that any team would really suffer if you took their top corner out of the picture, I think the lack of depth here is among the worst in football. Sam Beal is the wildcard but we can’t act like he was ever a top rated prospect anyway. The extra picks NYG acquired via CLE could have been very much about adding a piece to the CB group earlier than most think, maybe as early as #17 overall. Lack of quality CB play with a questionable pass rush (and that is being kind) is a recipe for disaster.